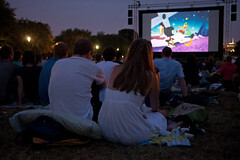 Ah Screen on the Green, we’re happy to see you back. This year’s event will take place between 8th and 14th streets on the Mall, and will be underwritten by HBO and Comcast. The set of films in this year’s batch are all classics, so you’d be silly to miss them. I’m betting that some of the city’s finest mobile purveyors of tasty picnic fare will be nearby, so plan on heading down to the Mall this summer for a wonderful evening watching a great classic film.